When the winter chill sets in, it’s time to face the sun and head north to the warmth of the Top End. But where to go? Well, when it comes to places to set up camp, Australia’s north is a veritable goldmine of well-known spots and hidden gems. From Western Australia to the Northern Territory to Queensland, we’ve compiled a list of some of the best places to pull up a perch in the Top End. 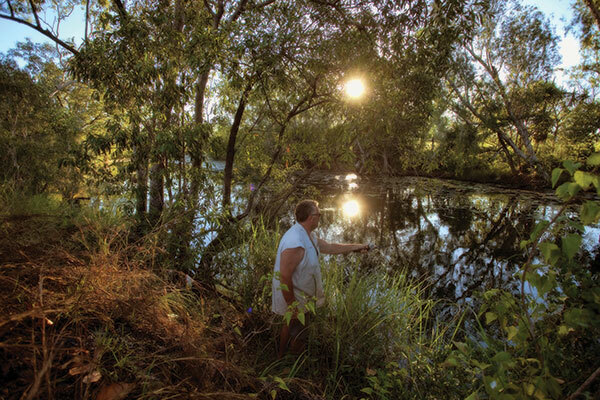 No list of epic Top End campsites would be complete without mentioning Lorella Springs. This family-owned station is a whopping million acres, and is undoubtedly one of the most unique camp experiences in Australia, with serenity and solitude in spades. Within the park’s boundaries you’ll find open savannah, mangroves, salt flats and an abundance of bird and wildlife. There’s no end to the ways you can explore this incredible landscape either. There’s fantastic fishing spots, beautiful bushwalks, and a number of 4WD tracks to head out on and discover. There’s also hot springs within the wilderness park, the perfect way to relax after a big day hiking or driving. Historically, this is a treasure of ancient sites and indigenous rock art, making this not just a great natural experience, but an outstanding cultural experience as well. It’s little wonder that many travellers who visit Lorella Springs end up staying for months on end. Once you arrive, you’ll see just how hard it is to drag yourself away. When it comes to stocking up on supplies, there’s full facilities available at the station’s homestead, including accommodation. However, the best way to the best way to experience this incredible landscape is to head out into its vast remote wilderness. This is a place that’s bigger than some countries, so you won’t have a problem finding your own patch. A haven for anglers and birdwatchers, Limmen National Park is a Northern Territory hot spot, only declared in 2012 and boasting no end of corners to explore and awe-inspiring landscapes to take in. Within the second largest national park in Australia is a little gem, Butterfly Springs. As pretty as its name, this postcard-perfect spot is home to a picturesque free campsite. If that wasn’t enough to put it on your radar, it’s also home to one of the very few croc-free swimming spots in the park as well, making it the perfect place to cool off and relax without fear of becoming dinner for the locals. However, if too much chill out time doesn’t really do it for you, pull on your hiking boots and explore the surrounds (you’ll be occupied for a while!). The striking towering sandstone formations of the Southern Lost City and Western Lost City are nearby, and make for fascinating exploration sites during a hike or drive. For keen anglers who fancy throwing a line in, there is also great fishing in the Roper River. 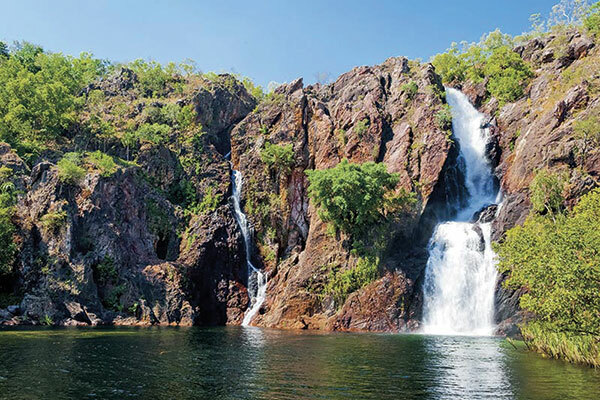 It was once a hidden spot, but these days the secret of Litchfield National Park’s beauty is out. But don’t let that deter you! There are still plenty of reasons to head here and park the van, one of which is Wangi Falls. A relaxing spot amid beautiful surrounds, it boasts great swimming (although taking a dip isn’t permitted all year round due to water levels), and plenty of shade to cool off under. Half an hour’s drive away is Florence Falls, a double waterfall with a panoramic lookout. Buley Rockhole is also a top swimming spot with its beautiful cascades. However if you’re towing a van, Wangi is your only option with its unpowered caravan sites. The saying ‘good things come in small packages’ often rings true and it’s certainly the case with Keep River National Park, which sits close to the Western Australia border. 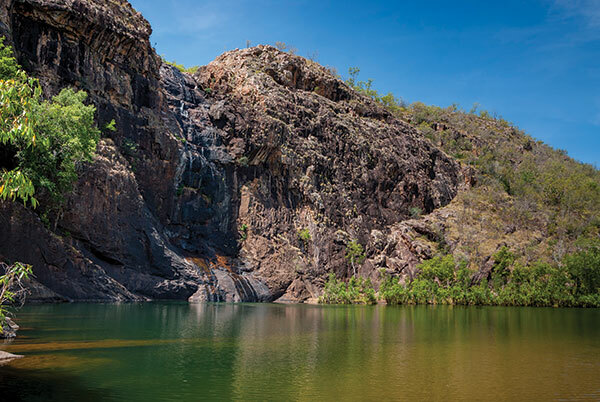 It’s less than three per cent of the size of Kakadu National Park but although it may be on the small side, it’s no slouch in the scenery department. 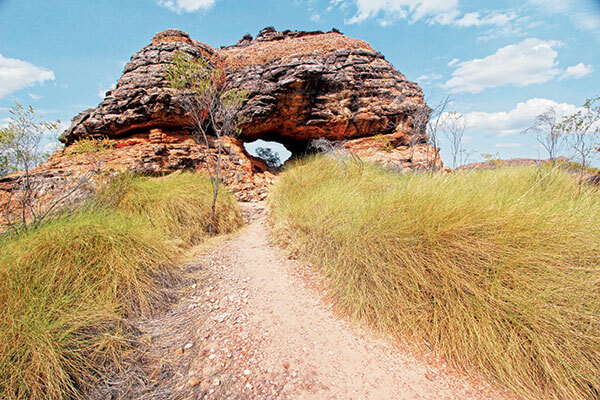 In fact, it’s home to some of the territory’s most stunning landscapes and intriguing indigenous rock art. It gets extra brownie points for accessibility, too. It’s easy to find and you don’t need a 4WD to get in during the dry season, although the corrugation can get a little bumpy. There are two campsites in the park, Jarnem (32km from the entrance) and Gurrandalng (18km from the entrance). Both feature interesting walks that take in fascinating rock formations. There’s also more than 2500 indigenous rock art drawings located along the 28 km of main road. Cockatoo Lagoon is not far from the entrance of Keep River NP and information centre and this is a fantastic spot for birdwatching with most of the land within the part within the Keep River Important Bird Area, so remember to bring your binoculars. 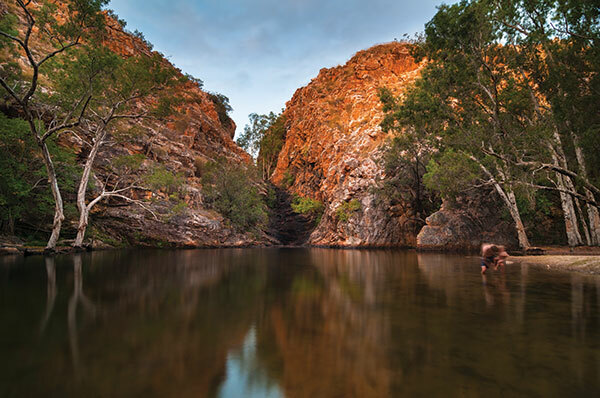 There’s no questioning the iconic status of Kakadu National Park. A timeless land with a rich history and many stories waiting to be told, it’s easy to see why it’s World Heritage-listed. Gunlom, located on Waterfall Creek, is one of the most beautiful spots within the park, and the rewards for those who battle the corrugated road to get there are plentiful. There are endless things to discovery, but if you’re a keen hiker or swimmer, this is the place for you. The full feature appeared in Caravan World #565. Subscribe today for the latest caravan reviews and news every month!